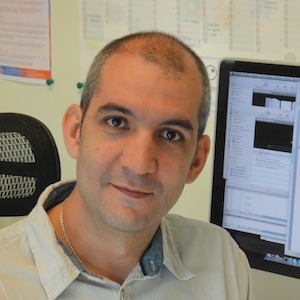 CSIC professor at the IBMCP. RNA viruses are the main source of emerging infectious diseases owed to the evolutionary potential bestow by their fast replication, large population sizes and high mutation and recombination rates. However, an equally important parameter, which is usually neglected, is the topography of the fitness landscape, that is, how many fitness maxima exist and how well connected they are, which determines the number of accessible evolutionary pathways. 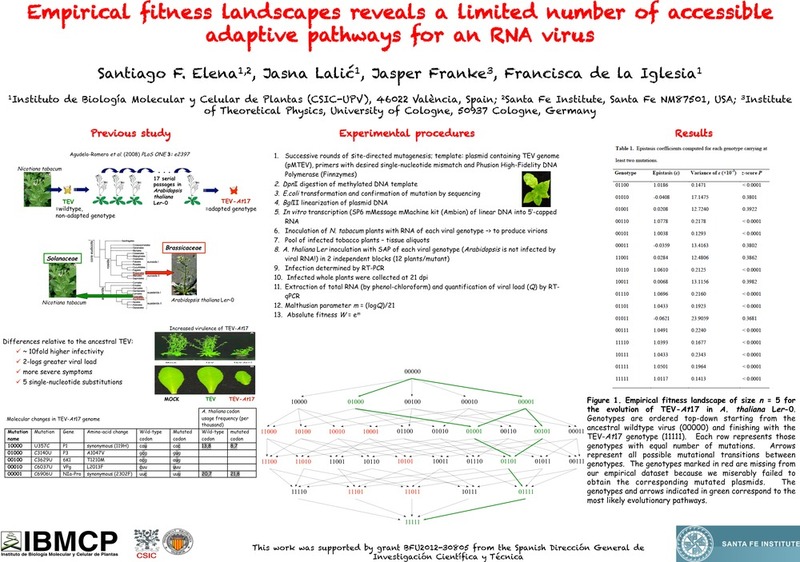 To address this question, we have reconstructed a fitness landscape describing the adaptation of Tobacco etch potyvirus to a new host, Arabidopsis thaliana. 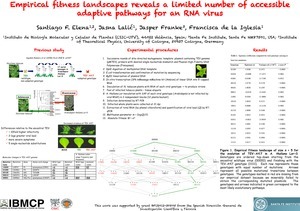 Two fitness traits were measured for most of the genotypes in the landscape, infectivity and virus accumulation. We found prevailing epistatic effects between mutations in the early steps of adaptation, while independent effects became more common at latter stages. Results suggest that the landscape was rather smooth, with a high number of potential neutral paths and a single fitness peak. The importance of historical contingency in determining the evolvability of virus has been largely unappreciated. Identifying the constraints imposed by past adaptation is, however, of importance for understanding the evolution of host usage dynamics by multi-host viruses or the emergence of escape mutants that persist in the absence of antiviral treatments. To address this issue, we undertook an experimental evolution approach. Sixty lineages of Tobacco etch potyvirus that differ in their past evolutionary history and degree of adaptation to Nicotiana tabacum, and thus in their position on the adaptive landscape, were allowed to adapt to this host for 15 rounds of within host multiplication and transfer. The degree of adaptation to the new host as well as to the original ones was evaluated and the consensus sequence of each evolved lineage was obtained. Past evolutionary history did not determine the phenotypic outcome of this common host evolution phase. By contrast, historical contingency left footprints at the genotypic level: the majority of host-specific mutations present at the beginning of this experiment were retained in the end-point populations and may have affected which new mutations were consequently fixed. Further divergence between the sequences occurred despite a shared selective environment. Our results imply that viruses are not easily trapped into suboptimal phenotypes and that TEV (re)emergence is not evolutionarily constrained.